There is a report HERE that Cardinal Schonborn, talking to 5000 (a prophetic number?!) from Holy Trinity Church, Brompton Rd, Knightsbridge (universally known as HTB), thinks that there is hope for re-union progress under the current stewardship of the Bishop's of Rome and Canterbury. How wonderful if that could be the case and as he points out the Holy Spirit can move fast and in unexpected ways (viz. who would have thought a few years ago that married Anglican bishops and priests could be offered a home in the Roman Catholic Church of the new Ordinariate). However, given that the first thing the Archbishop of Canterbury did was to declare his belief in the new change to the catholic order of Bishops inherited by the Anglican church at the reformation by opening it to women, how on earth could this come about? Only by a huge about face by the national Church of England and it is almost impossible to imagine this happening. Or is it? Suppose that the new legislation to allow women bishop's failed at the final hurdle all might be possible for re-union again. It seems a very long shot but we know the power of God the Holy Spirit is very strong. 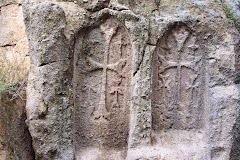 We must never give up praying to Him that the universal Church may be one again; (divided as it is from our perspective by an accident of history in the 16th cent.) in the knowledge that what seems impossible for us is not for Him. The irony is that it wasn't very long ago that the evangelicals at HTB would have supported male headship as biblically based and untouchable by modern liberal preferences motivated by a misguided imposition of social "justice" and secular "equality" of gender. Instead of celebrating the differences of male and female as created and ordained by God some of the evangelicals at HTB which of course includes the Archbishop of Canterbury appear to have been distracted (let's hope temporarily) by the secular rather than the biblical imperative. 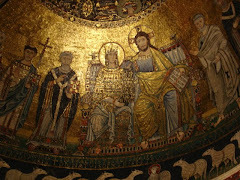 But perhaps not all, and just maybe the tide could turn; the more dialogue with Rome the better. 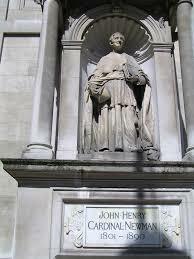 Blessed John Henry Newman's best statue is in London where he presides over the Brompton Rd. right in front of both The Brompton Oratory and.....none other than HTB church immediately next to it! Could this be another of the signs that the cardinal spoke of? I have an enormous respect and love for HTB, it is where I went to Sunday school and learnt the traditional faith and in those days about the sacraments too. We even had processions on feast days with clergy in copes! It was where my late father was a church warden. Things have moved in a different and more evangelical direction now and there is wonderful work being done. Could the scandal of a divided church of Christ be the next prophetic mission of HTB to address? That would be a fruiting of the works of the Holy Spirit beyond wildest dreams and a fruition of the enormous amount of work, prayer and witness begun by Bishop Sandy Miller, Fr.Nicky Gumbel and their co-workers for Christ; a new vision at this time of Pentecost when all understood each other in a new and God given way. that we will all be one. At this time when we celebrate Pentecost, may the Holy Spirit leads to become one.